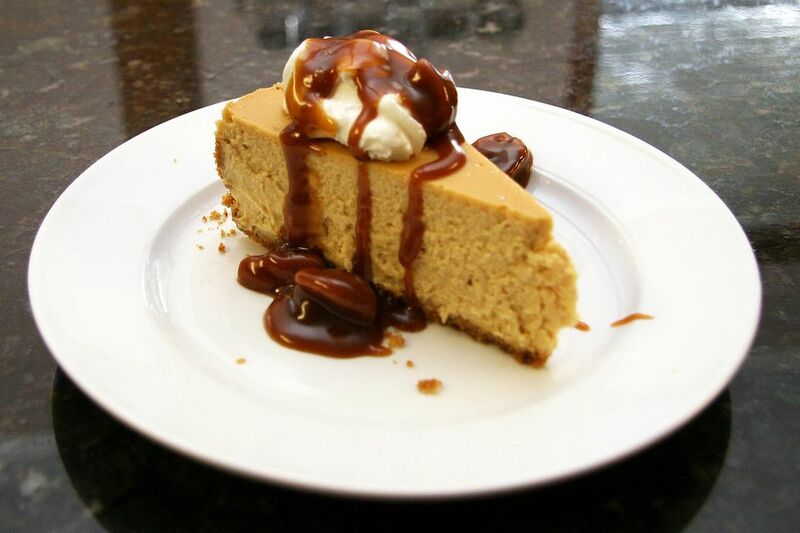 Top this cheesecake with the delicious caramel pecan sauce, or serve it with a dollop of whipped cream. This is a fabulous cheesecake to bake for a special occasion or even if you're just feeling peckish after a long week. It'll make a fabulous dessert for a holiday menu, or take it to a potluck dinner or special event. Wrap the bottom of a 9-inch springform pan with 3 or 4 layers of heavy-duty foil. Combine the crust ingredients; pat into the springform pan, patting gently partway up the sides of the pan. Place in the refrigerator or freezer while you prepare the filling. Beat cream cheese until smooth and fluffy; beat in brown sugar until light and well blended. Slowly beat in the eggs, then the sour cream and vanilla. Beat just until well blended. Pour into the prepared crust. Place the foil-wrapped pan in a large, shallow roasting pan. Place in the oven and add about 1/2 inch of hot water. Reduce heat to 325 F and bake for 45 to 55 minutes, until the cheesecake is firm around edges but still slightly jiggly in the center. Turn the oven off and leave the cheesecake in the oven for 30 minutes longer. Place the cheesecake on a rack to cool to room temperature. Remove the pan sides. Heat the 5 tablespoons of butter and pecan halves in a saucepan over medium heat. Cook, stirring until the butter is lightly browned and pecans are aromatic. Add the brown sugar to the butter and cook, stirring, until the sugar is dissolved. Stir in the cream until well blended and heat through. Serve with bread pudding, cheesecake, or pound cake. Refrigerate leftover cheesecake and sauce. Warm the sauce slightly and thin as necessary with a little cream.